The cost of a proposed 200-mile road into Northwest Alaska could weigh heavily on the dinner tables of villagers living near the route, a new study says. 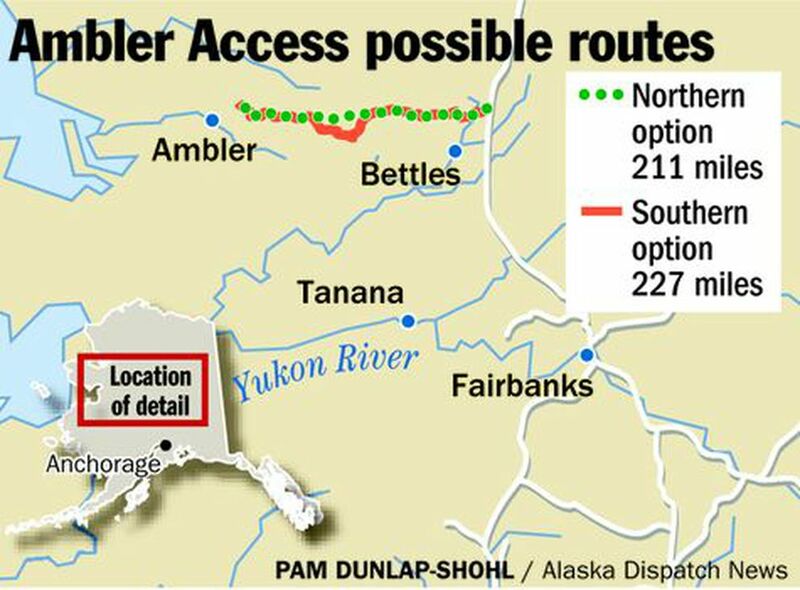 The controversial Ambler Mining District Access Project, if built, would take subsistence food from the people who live in the 10 villages near the proposed road corridor, says the study, led by the University of Alaska Anchorage's Institute of Social and Economic Research. Village residents would lose subsistence foods worth $6,900 to $10,500 per household, according to the study. The expected loss is equivalent to about a third of the annual median household income in those villages, according to the study, published in the journal Arctic, published by the Arctic Institute of North American at University of Calgary, Alberta. "Our results suggest that a road through this region could have substantial impacts on subsistence production of affected communities," the study concludes. Residents of the villages in what is called the "project zone" are highly dependent on caribou, whitefish, moose and other wild foods. Households with the lowest incomes and the most children are the most dependent on such wild foods, and they would suffer the steepest losses, according to the study. The study was paid for by the National Park Service. The Ambler road is envisioned as an industrial-only route to allow equipment, supplies and mined ore to move between Alaska's existing road system and the Ambler Mining District on the south side of the Brooks Range. The study assumes that the road would, over time, become a general transportation route bringing in nonlocal hunters and fishermen who would pressure existing supplies, said Mouhcine Guettabi, an ISER economist and the lead author. Though not the current plan for the road, it would fit the history of industrial roads in Alaska, he said. "What we've seen in the past is some roads started out as private and eventually became public," Guettabi said. Among the longest: the haul road is now the Dalton Highway, from north of Fairbanks to Deadhorse. The study compares the 10 project-zone communities with 22 communities outside the zone. The project-zone villages would not be directly on the road, but would be near it. The largest is Anaktuvuk Pass, with a population over 300. The combined population of the 10 communities is 87 percent Alaska Native; 80 percent of households are headed by women. Among the nonproject-zone villages, 29 percent of residents are Native and 36 percent of households are headed by women. The biggest nonproject-zone community is Tok, with about 1,300 people. The nonproject-zone communities generally have road access, which might account for some of the demographic differences, Guettabi said. Economic values of the foods used by villagers — and potentially lost if the road is built — are based on analysis by the Alaska Department of Fish and Game. There would be some road benefits to the project-zone communities, according to the study. Delivery of fuel could cut annual heating and electrical costs by $2,755 to $3,737 per household, and up to 13 new jobs would come with the road, the study says. The study did not weigh those benefits against food losses, Guettabi said. "We shy away from doing some sort of cost-benefit analysis," he said. Whether the Ambler road ever gets built is uncertain. The oil-dependent Alaska state government is in dire fiscal straits, hit by dwindling oil production and low oil prices. Other proposed megaprojects have been tabled, and Guettabi acknowledged prospects are murky. "If I was a betting man, I'd say not very likely. But I'm not, so I don't know," he said. The road is one of the many Alaska megaprojects proposed over the years to spur commercial development of remote natural resources that have stirred significant opposition from local residents. It had been grouped with other ambitious transportation projects in what former Gov. Sean Parnell called his "Roads to Resources" program. One of those projects was a proposed road to potential oil and gas production sites near Umiat on the North Slope; that project, expected to cost at least $350 million to build, was halted in late 2014. Gov. Bill Walker, in a cost-cutting move, in June shut down work on two big-ticket projects, the Knik Arm Crossing to build a bridge between Anchorage and a sparsely developed section of the Matanuska-Susitna Borough, and the proposed Susitna-Watana hydroelectric dam. The Ambler road remains an active project within the Alaska Industrial Development and Export Authority, the state agency charged with planning it. While there was no new money appropriated for the project in the current fiscal year's budget, AIDEA is still authorized to spend up to $3.6 million in previously allocated funds to continue planning, said Karsten Rodvik, an agency spokesperson. The agency has submitted right-of-way applications under the Alaska National Interest Lands Conservation Act, a necessary step because the road would cross through Gates of the Arctic National Park. Federal agencies have accepted those applications, Rodvik said. Work is proceeding on the scoping process, part of the formal environmental review, he said. The Vancouver-based mining company that would be the main Ambler road user continues to pursue development and conducted a field season this summer. Previously called NovaCopper, the company has changed its name to Trilogy Metals. It recently sold a Brazilian copper property, a transaction the company's president said would allow it to focus more on its Alaska prospects.